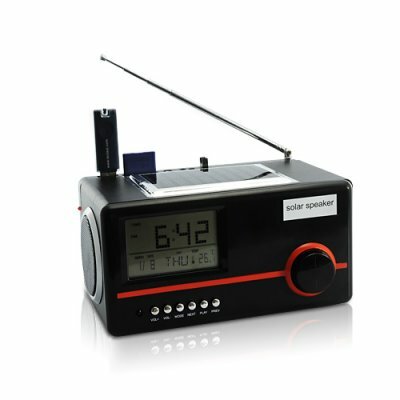 Successfully Added Solar Mini Speaker Charger + MP3 Player + Alarm Clock (Black) to your Shopping Cart. A super Solar Mini Speaker that does it all. It effortlessly takes the sun's rays and saves it to its internal lithium-ion battery. It's an awesome PC speaker that works great with laptops, MP4 players, and other portable devices. This baby also plays MP3 files from USB flash drives and SD cards! It's an alarm clock with temperature data. It even charges your cellphone! It even comes with a free remote control! Oh my! Powerful and Practical: As long as the sun is out or there's a bright light source, this mini speaker will continue to function. Better still, it saves whatever excess energy it can't use into its built-in internal lithium ion battery. And EVEN better is that you can power and charge your cellphone or other portable devices with this amazing solar mini speaker! It Loves to Play: The Solar Mini Speaker Charger plays FM radio and also has a USB port and SD card slot on top. Plug in your flash memory and this solar speaker automatically plays whatever MP3 files it finds! What's more attach your portable device to it for audio output of the highest quality! The Solar Mini Speaker Charger works great with: iPods/iPhones, MP3/MP4 players, Portable DVD players, Portable game systems like the Nintendo DS / Sony PSP, Laptops, notebooks, and netbooks, UMPC, MID, tablets, and smartbooks, as well as cellphones and smart phones! It Loves to Do More: Aside from incorporating S-2-O (Solar To Output) technology which allows you to solar charge your portable devices, The Solar Mini Speaker Charger also comes with an alarm clock and even displays the current temperature! Best of all is the sound output from these mini-speakers! Surprisingly powerful and stunningly clear, The Solar Mini Speaker handles deep bass and sharp tones like a pro for a brilliant stereo performance of the highest highs and the lowest lows every time! Hear them for yourself and you'll agree that this baby sounds better than speakers double or triple its price. Add to cart now and we'll express ship them tomorrow. Direct to you or drop-shipped to your customer as if they came from you - Chinavasion, the leader in online wholesale electronics. Amazing sound and LOUD too! Alarm clock (with snooze) and timer functionality! Comes with cellphone attachments for Nokia, Samsung, etc brand cellphones allowing you to solar charge your cellphone and other portables devices. Use this is as a standalone MP3 player or as a traditional speaker. This unit is loud! Don't be surprised if the police knock on your door and ask you to turn down the volume. This makes a wonderful iPod or iPhone or iPad speaker! What is the maximum SD card or USB drive this unit supports? I enjoy listening to Britney Speakers. Does this speaker play Britney Spears MP3 files? You can try, but the speaker might turn itself off, get depressed, and crawl back into its box.